Happy Monday everyone!! 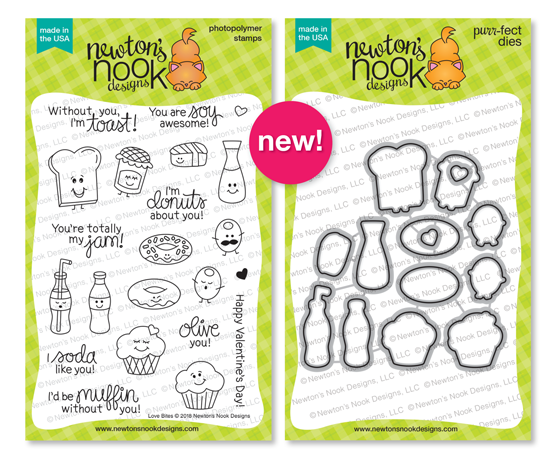 It's time for a peek at the new release from Newton's Nook Designs. 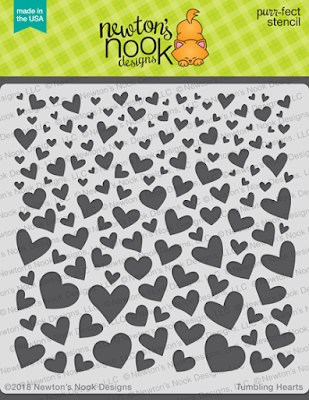 We're kicking the week off with a Fun new Tumbling Hearts Stencil and Love Bites Stamp set. All the new products will be available in the store on Friday, January 19th. I stamped all the images onto some watercolor paper as well with Ranger Archival Black ink and colored them in with Distress Inks. I used Abandoned Coral in each of the images so coordinate with the background. I used the coordinating dies to cut them out and adhered them with some foam tape. For a little extra sparkle, I added some Clear Glitter drops from Nuvo over the hearts. So cute!!! The Tumbling Hearts Stencil and Love Bites Stamp set are must-haves for your collection. Would you like to win the “Love Bites” Stamp Set? Comment on the NND blog and Design Team blogs (see list below)! The winner will be chosen at random from the collective reveal posts. Make sure to check out each of their blogs and comment for your chance to win. You will not know which blog has been chosen so the more you comment on the better your chances are of winning! You have until Thursday, January 18th at 9pm EST to comment -- winners will be announced on the blog post on Friday, January 19th. I've been looking for a heart stencil and this one looks perfect!! Your cards are so cute. Thanks for the inspiration. Adorable! I love the idea of the mini cards! So cute! These are adorable! The "soy awesome" one is very cute! These little images make me smile--too cute! Can't wait to make some fun Valentines! Love how adorable this set is. Your little note cards are sweet. These cards are so much fun!!! Love simple and cute design!!! Love the size of these cuties and I love your choice of inks and colors. Just perfect! These cards are so cute! I love the mustache on the olive!! Your cards really highlight how cute these stamps and stencil are. It's great to see the lovely results of Distress Ink colouring. Thanks for the inspiration. Darling cards! Love the heart stencil backgrounds! I simply adore your cards. This set is wonderful and you have done such clever things with it! So cute. I like the tumbling hearts background. So cute! I love smiley faces on food - makes me smile! Gorgeous heart stencil too! Adorable card! Your cards are adorable. Just love the cascading a heart stencil. Perfection. 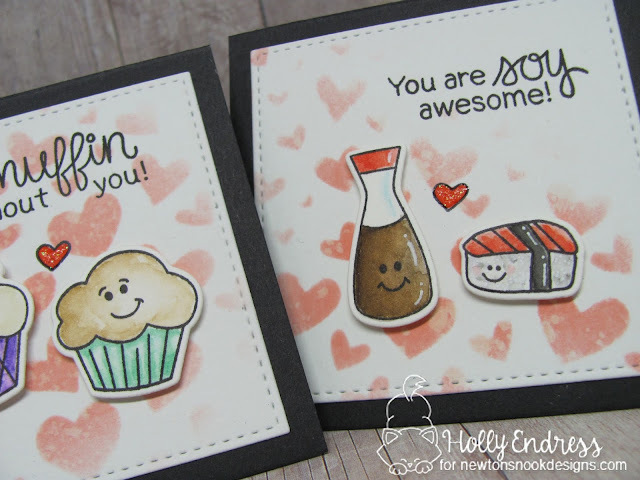 Your cards are simply the cutest!!!! Great use of the stencil on these cute cards! Such a fun set. Cute cards. These cards are so cute. Great Valentines Day ideas. Your coloring looks wonderful and the 3 x 3 size is so cute with the smaller images. Fun designs! 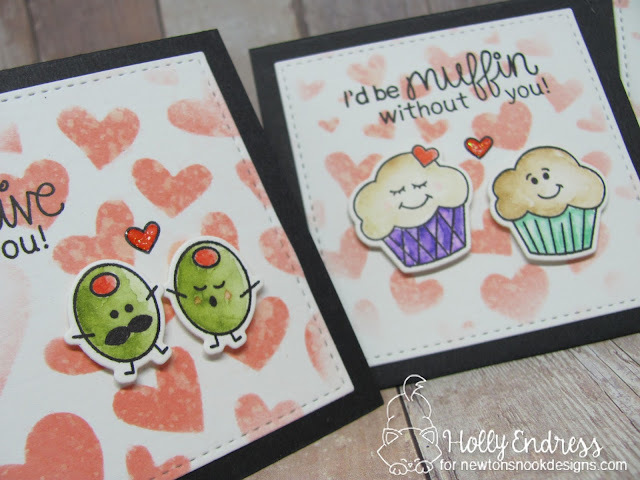 Super cute projects Holly! Love the stencil! 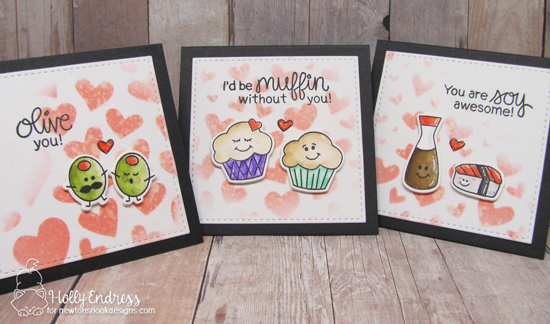 Love your cards and pick of Distress Oxide for the background! Cute cards! You've really done a great job showing off this set! Thank you for sharing your creativity with us! Fabulous cards! I love the stenciled hearts on the background! Your creations are all so adorable !